Corpus Christi is currently undertaking a unique, creative, and bold effort to build a world class waterfront in its downtown. Destination Bayfront, along with the City of Corpus Christi and hundreds of interested citizens, have launched a campaign to improve the waterfront using a process that has tapped into the knowledge and experience of its citizens in a way that, from our experience, is unparalleled anywhere else in the country. 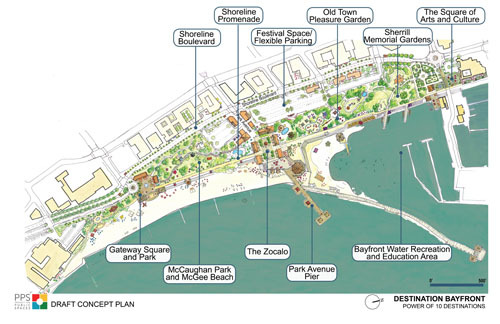 The Bayfront's Draft Plan was recently released for public review. "It can become so exciting, it can change the perception of Corpus Christi from a city that's very quiet to a city that has a lot of dimensions to it, that's really one of the great cities in Texas," says PPS President and founder Fred Kent. Destination Bayfront, a grassroots group of citizens in Corpus Christi, TX, understands the idea of creating a great public multi use destination on its waterfront and enlisted PPS’ services to help them achieve this goal. Sensing the real potential to transform the waterfront, hundreds of community members attended a series of public meetings throughout 2010. Citizens gathered to build a common vision for the different kinds of activities and improvements that could occur on the waterfront site. Ideas were as wide ranging as seawater slides off the jetty to farmers markets to boardwalks with local performers and artists. The goal of the project is to use PPS' Placemaking process to create a gathering place for people in the city and a destination that will improve Corpus Christi's economic health. In recent years, waterfronts have once again become the focus of redevelopment for many cities, this time as priceless public spaces, and there have been both successes and failures. Although some cities have managed to avoid common pitfalls and have created great destinations on their waterfronts, many more have not. The pitfalls range from privatizing the waterfront with high rise residential or fortress type convention centers to planting swaths of green space that provide few opportunities for people to use them. The best waterfronts are developed primarily as public destinations and are strong economic engines that support local businesses. They have succeeded by creating highly accessible, multi-use destinations that include green spaces but are not exclusively defined by them. They use the tried and true approach of focusing on creating a place that attracts residents first, knowing that tourists want to be where they can experience how a real community lives. Projects like the Corpus Christi Bayfront demonstrate how both "sustainability" and "placemaking" are both important considerations in waterfront developments today. Placemaking is both a process and a philosophy that takes root when a community is able to express their needs and desires about the places in their lives. It enables people to realize just how inspiring their collective vision can be, allows them to look with fresh eyes at the potential of the public spaces in their cities and sparks an exciting re-examination of everyday settings and experiences in our lives. Sustainable places and cities emerge naturally through this process by creating destination spaces that are used and loved by the community. The Corpus Christi waterfront has many natural assets. Not only does the City have one of the best climates in the United States for attracting people on a year round basis, it also has a two mile length of shoreline that, for the most part, has not been interrupted by private development. And, it is located adjacent to the downtown. With the project to realign Shoreline Boulevard comes an opportunity to create a strong connection between the downtown and the Bay, as well as a major destination for the region. Altogether, this makes Corpus Christi poised to become the best waterfront on the Gulf Coast if it continues the community based process it has started and stays close to its initial goal of enhancing the uniqueness of the public beach and the surrounding area, creating a signature waterfront destination for everyone. Our own experience in Corpus Christi started about 20 years ago when Project for Public Spaces (PPS) was part of a team developing public spaces around the newly conceived transit system so that people would find it convenient and attractive to use. Growing out of a process that we facilitated, but mainly due to the inspiration provided by many, many members of the Corpus Christi community, the Staples Street Station was built and later received the Presidential Design Award. Today, close to 100 years after the hurricane of 1919, which was recognized as one of the four worst natural disasters of the 20th century, there is a unique opportunity to bring back the vibrancy and life that the waterfront once provided to the citizens of Corpus Christi. They have only to seize that opportunity. 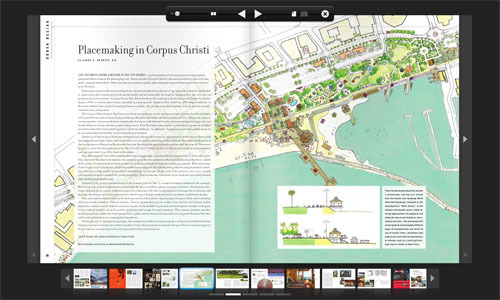 Texas Architect Magazine devoted its July-August 2011 issue to Placemaking and highlighted the extraordinary citizen-led change in Corpus Christi. Click on the image to read the full article. 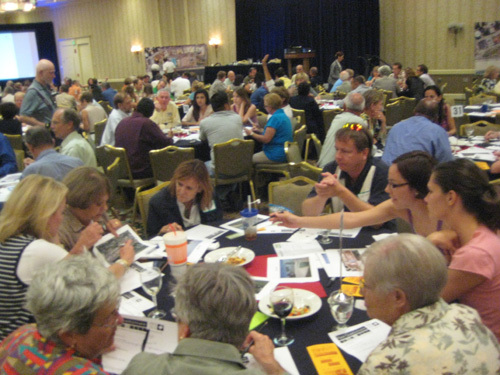 Texas Architect magazine devoted its July-August 2011 issue to Placemaking and reports on the remarkable story of community involvement through which more than 2,500 community members participated in more than 80 public meetings. Their input was all incorporated into the Waterfront’s master plan. Read more here.